Hello, hello! I returned home from my first trip to Europe a few days ago (READ MORE: Candidly Kristen – I’m Back from Europe!) and I’m still (not adjusted back to Eastern time &) reflecting on such an incredible trip! My family and I stayed in Rome for a few days before embarking on a 7-day cruise of the Mediterranean, stopping in Italy, Spain, and France. We were away for almost two weeks, and we did so much every day it’s so difficult to fully explain all we saw and did! In this post and video, I’m giving a brief overview of our general itinerary and the cities we visited. For the sake of brevity, I edited the YouTube video as short as possible, so I could get through everything I wanted to say! I’ve been getting some questions on Instagram and Twitter about specifics of some of the places we went, but there’s just so much to cover, it’s hard to include everything! In this post, I’ll be including more specific details with what tour companies we used and what we visited in each city. Watch the video version of this post (click here or watch above)! Like I said in the video, we mainly used the company Viator, as well as some recommendations from my parents’ friends. We flew overnight from Tampa, through Atlanta to Rome, and stayed in an AirBNB for our first few nights in the city, which was amazing! Since we traveled with 5 people, it was much more comfortable for us in the 3-bedroom, 2-bathroom apartment we rented across the street from the Vatican. The AirBNB ended up being less expensive than a hotel! We loved immersing ourselves in the city by staying on a residential street, instead of a commercial hotel. We were somewhat worried about staying in an AirBNB abroad, but would highly recommend it after this experience. Since we arrived to Rome in the morning, we scheduled a four-hour driving tour of the city with a private driver through Viator. We were exhausted from the 18+ hours of traveling, but the tour was a good jump-start to seeing the city and adjusting to the time change. During our stay, we toured the Colosseum (with ‘skip the line’ tickets, so worth it! ), the Roman Forum & Palantine Hill (both on one ticket, regular admission), the Vatican museum and Sistine Chapel (again with ‘skip the line’ tickets, the regular line stretched across St. Peter’s Square), and St. Peter’s Basilica. Making a wish at Trevi Fountain! The square were Rome was founded! We also visited the Trevi Fountain, the Pantheon, the Spanish Steps, and the old capitol building (the spot where Rome was originally founded), along with lots of cute restaurants and shops. Rome is arguably the most historical city in the world and it was so truly incredible to visit. Being both Catholic and a history-nerd, it made the visit even more marvelous! My family loved seeing how much the Catholic faith is a part of Roman history (albeit, not all positive, but still) and how the Vatican fits in, too. The Sistine Chapel was a family favorite (pictures aren’t allowed inside), and inside, we prayed with a priest who gave our family the most beautiful personal blessing. We cruised on Royal Caribbean’s Symphony of the Seas (currently, the largest cruise ship in the world!!) and boarded the ship in Rome. We hadn’t been on a cruise since 2008, and it was fun to be on one again! There’s so much food all the time and so many fun activities to do and shows to see. We had the ‘early’ dinner reservation in the main dining room, and our fancy family meals each night were some of my favorite memories of this trip. Do you think I look like my dad?? I don’t usually but I see it in this picture! One of my favorite parts of the whole trip was capturing moments like this one! How cute are they?! They’ve been married over 28 years and while we were on the trip, my dad reminded my mom that it was the 30th anniversary of their very first date! 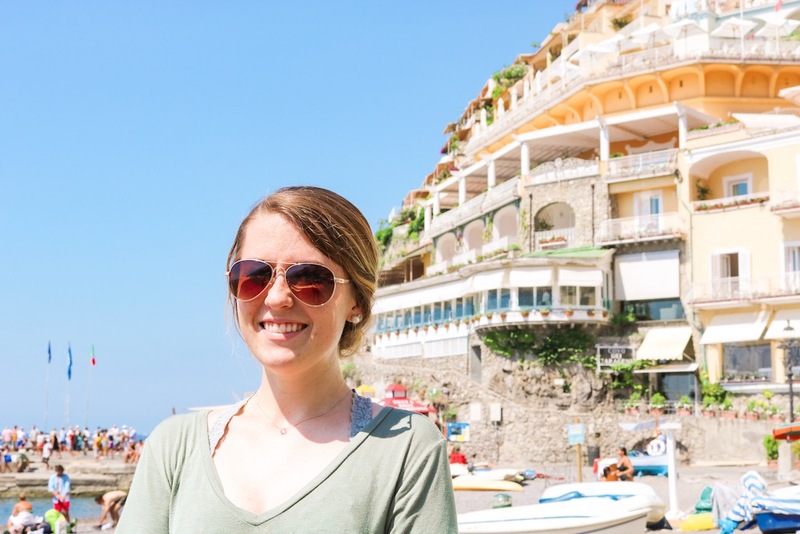 From the port of Naples, we toured with a company called SeeAmalfiCoast (by a recommendation of a family friend, who’d recently been to Europe) and this might have just been our favorite tour & tour guide! Our guide’s name was Manuela, and we absolutely loved spending the day with her. From Naples, we drove to Positano, Sorrento, and Pompeii. Along the way, we stopped at the cutest Italian bakery to try Manuela’s favorite lemon cake/custard (lemons are huge in the area, literally! They grow everywhere and there, they’re the size of melons, no joke. ), a local restaurant called the Donna Sophia (another favorite from our trip), and a Limoncello factory in Capri (which was so cool!). After Rome, Barcelona was my next favorite city! We were on a 12-person tour with Viator. On this tour, we were shown around beautiful, historic Barcelona, and taken inside Park Güell (for the most ‘Barcelona’ spot I’ve seen in so many pictures on these beautiful mosaic benches). We also saw the Sagrada Familia basilica, which was probably the most amazingly-designed building/church I’ve ever seen! The famous architect and designer Gaudy began working on the basilica, and construction (which began over 100 years ago) has continued long after he passed away, but is estimated to be completed in 2026. In Mallorca, we did a ‘Hop On, Hop Off’ bus tour of the city, which was probably our least favorite tour of the trip. Like I talk about in the video, the city itself was beautiful, but the bus tour itself was lacking. We probably would’ve been better off exploring the city on our own or heading to the beaches for the day! I wasn’t feeling well from not sleeping a lot the night before due to motion sickness (the only day I was motion-sick the whole trip! Which is a feat for me, because even short car rides can make me so sick. I took Dramamine every morning since we were always on a boat or in a car, and that really helped. ), so I stayed on the ship for a relaxing day by the pool. My family did another small-group tour of the city with Viator and really enjoyed it! Oh, goodness, we spent so much of this day waiting around or in the car!! We booked a tour with ‘TuscanyBUS.com’ and besides the Hop On Hop Off bus in Mallorca (these bus companies are pretty much the same anywhere), they are the only private tour company we wouldn’t recommend from our trip. The tour had about 50 people, and we weren’t huge fans of the tour guides. Although we could’ve booked another small-group or private tour, we still just weren’t impressed with the same this company, whose job is to run these tours, handled themselves on this day. After waiting over an hour for everyone to arrive to the meeting spot, we first drove about 90 minutes from the port to our first stop, Pisa. We didn’t know what to expect from Pisa, besides the famous leaning tower. Like I talked about in the video, we were pleasantly surprised by the beauty of Piazza del Miracoli (Plaza of Miracles), the square where the tower is located. Right next to the tower, which was actually built as a church bell tower, are two beautiful buildings (one is the church, and we weren’t sure what the other was, we didn’t have much time at this stop). We did take the touristy ‘holding up the tower’ pictures, but we really were so amazed by the beauty of Pisa! Don’t fall down, Pisa, I believe in you!!! Next, we drove to Florence! Surprisingly, Florence felt the most to me like visiting NYC or Disney World to me. I was extremely overwhelmed by the amount of people and hustling-vendors everywhere, and that unfortunately took a lot away from me being able to enjoy the city. Like I’ve mentioned, I’m very prone to motion sickness, get very nervous on planes and boats, and am easily overwhelmed in large crowds. This whole trip was a big step out of my comfort zone, basically the entire trip! Florence was our last real tour on this vacation, and maybe it was the exhaustion of traveling for so long combined with the extreme July heat, but it was hard for me to enjoy the city. I talked about this in my video-version of this post as well. I don’t want this to portray negatively on the city of Florence at all! It was much more to do with my personal reaction and comfort tolerance than anything else. I don’t recall the exact names of sites we saw in Florence, but there were some beautiful churches (with incredible green-and-pink marble! ), a large white arch, and beautiful views of the river. Florence was one of my mom’s favorite stops, and it was definitely a place you could spend much longer than one day. We ate more pizza (can you ever have enough, though?!) right in the heart of the city, and the shop owner was so so kind to us! The way she so warmly greeted us was a big highlight of our day and felt like our own personal welcome to the city :). After departing the ship back in Rome, we were exhausted for our final night in the city! We stayed at the Hilton Hotel at the Rome airport, and really didn’t do much besides rest that last night. I hope this post and video were insightful into my first trip to Europe and our Mediterranean cruise! Again, I’m so grateful that I had the opportunity to go on this trip. Overall, I really did enjoy it, and anything that shows otherwise is just to share my honest opinion, and hopefully help someone from the same troubles in the future! Thanks so much for reading! While you’re here, I hope you’ll subscribe to my blog below and YouTube via this link. You can also check out even more photos from this trip on my Instagram. Ciao! OMG! Looks like you had so much fun! Going to Europe has definitely been on my bucket list for the longest time! So glad you shared this with us. So glad you enjoyed this post, Caitlin! It was so fun to create & look back on such a fun trip. Yes!! A few of them were on my bucket-list as well! Sounds like an amazing holiday!!! Btw with what camera do you film your Youtube videos? The quality is great! Thanks for reading & watching, Andrea!! I use the Canon EOS Rebel T6i (& an Amazon tri-pod that was less than $20) and I absolutely love it!